A household battery recycling center is located at our Annex Station on the corner of Hopps Road and Stevens Road in Elgin Township. This is a drop off for household batteries only. 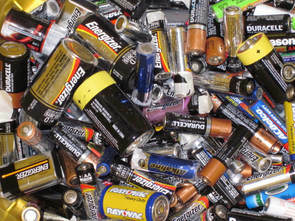 Residents are asked to tape lithium-based batteries as well as batteries of greater than 9 volts so they don't cause a fire while being transported to a recycling center. Most commonly used batteries – A, AAA, C, D, 6-volt and 9-volt don't need to be taped unless their packaging identifies them as lithium-based.